The tragic attacks on Charlie Hebdo and the Hyper Cacher supermarket in Paris have brought terrorism to the worldwide forefront. Lost in this news has been a tragedy that is taking place in the town of Baga in northeastern Nigeria. After overrunning the military base used by a multinational military force, Boko Haram (Jama’atu Ahlis Sunna Lidda’Awati Wal-Jihad) fighters are reported to have razed the town – burning it and killing the population with no mercy. Estimates range as high as 2,000 dead in what would be the largest massacre by this Islamist terrorist group. The attack started on January 3rd but details are still sketchy as the Nigerian government, which is in the midst of preparing for an upcoming presidential election, is keeping a very tight lid on information about this most recent Boko Haram attack and the ongoing security crisis they have been facing in the north. “On 4 January we spoke to a man who had walked for two days through the bush, eventually getting a lift to the relative safety of the biggest city in the area, Maiduguri, on a lorry. “There was shooting from every corner of the headquarters of the multinational task force,” he tells me, adding that the exchange of fire lasted hours. 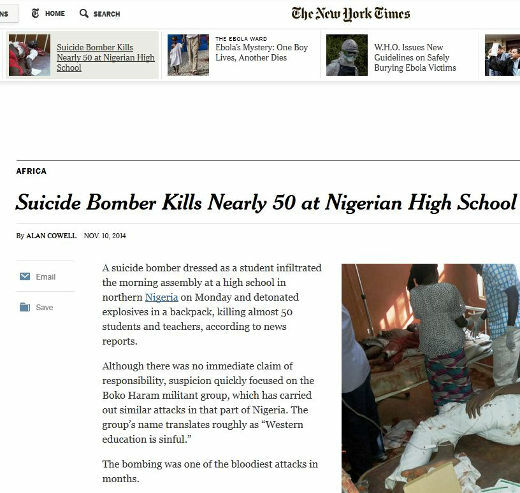 A suicide bomber dressed as a student has killed nearly 50 actual students and teachers in Potiskum, located in northern Nigeria. The suicide bomber got into the all boys high school that teaches a so-called Western curriculum and detonated a bomb housed in his backpack. We recall the hue and cry a few months ago when Boko Haram terrorists kidnapped hundreds of girls but things had been relatively quiet in Nigeria since then with even word of cease fires and release of the kidnapped girls. The regional (African) hub of worldwide attention had shifted to Liberia and Sierra Leone with the Ebola crisis. But in the last few weeks, Boko Haram was getting back in the news cycle with a suicide bombing in Niger, another bombing in Potiskum last week, renaming the town of Mubi to Madinatul Islam and inflammatory comments about the kidnapped girls having been converted to Islam and married off. 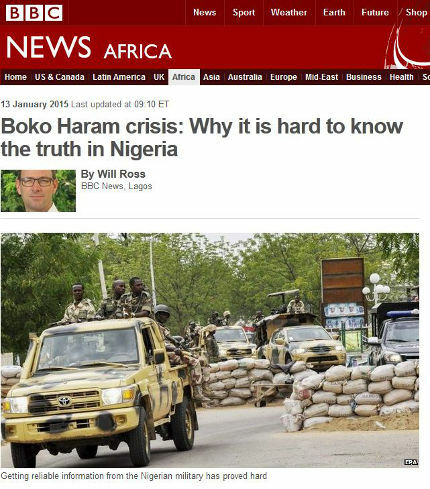 So why the sudden resurgence of Boko Haram? The African conspiracists point to an upcoming election in 2015 but is there fire, where there seems to be some smoke?